Drop-everything Bird: A bird whose presence within a few hour radius of your location compels you to immediately drop everything and GO. Black-tailed Godwit version. I have a lot of “drop-everything birds” that I’ve always wanted to see, especially in the Philly region: Barn Owl, Painted Bunting, Harlequin Duck, Roseate Spoonbill. But some of the best “drop-everything birds” are the ones that are completely unexpected; a species that you almost can’t even predict! This April’s “drop-everything bird” distinction is taken by one species and one species only: the Black-tailed Godwit. When the alert came across, I was wrapping up a nature walk at school and only slightly prepared for a chase. I had my binoculars, camera, and Phone Skope, but I didn’t have my scope! After rushing back to my classroom to borrow our classroom scope, a vintage, nameless piece whose only writing on it says “20x” on the eyepiece, I jumped into the car for a 30-minute ride to Pedricktown Marsh in New Jersey. Upon arrival, it was easy to notice where the birders had parked. On the shoulder of the road, I observed lots of Red-headed Woodpecker laden NJ license plates and stickers for various birding and nature organizations. Lots of cars, but no birders in sight! So I followed the “public access trail” signs until I met what appeared to be a deer path of sorts into the woods, likely made by other birders. Ducking under branches and hopping over multiflora rose, I arrived at a small spit of land, lined scope to scope with birders! The Black-tailed Godwit was observed almost immediately as it was feeding among Greater and Lesser Yellowlegs deep in the marsh! The godwit was very active as it moved among the other shorebirds, even taking off at one point to show its distinct black tail. Since I didn’t have my usual scope setup with me, I used my Phone Skope and U-1 Mini Universal Optic Adapter to plug my iPhone 8 Plus onto our classroom scope. I was able to get some documentation, but due to the only 20x power of the scope, I was forced to use digital zoom to get closer footage. Another nearby birder was kind enough to let me use their scope to get better footage of the godwit, but between the low light and the long distance, documentation was difficult! After the fact, I learned just how rare the Black-tailed Godwit is in the tri-state region! The last time this bird was observed in New Jersey was at Brigantine-Forsythe National Wildlife Refuge from May through August in 1971. The next record of the species was in Philadelphia at John Heinz National Wildlife Refuge for 10 days in October of 1979. 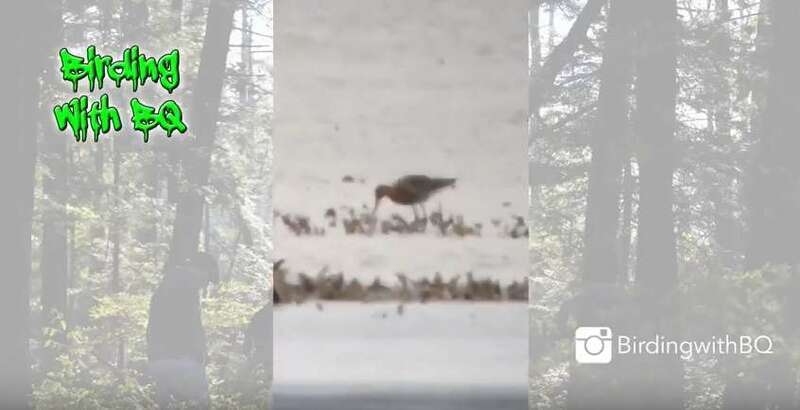 Most recently, Black-tailed Godwit was observed at Prime Hook National Wildlife Refuge in Delaware in June of 1994 and later in July of 2012. The Pedricktown Black-tailed Godwit stuck around for only 3 days, and oddly enough this was the first Black-tailed Godwit found outside of a National Wildlife Refuge in the tri-state region! A lesson learned: I should always keep my scope in the car. Drop-everything birds don’t give advance notice when they show up!